Our standard room has patio doors that open to the private poolside courtyard. Each room sleeps two adults in a cozy queen size bed with full bath. Includes a dresser closet and corner chair. Rooms are decorated in a mid-century modern theme. Free cable TV and WiFi. Our suite has a queen bed with private bath and kitchenette decorated in a mid-century modern theme. Kitchenette includes full size refrigerator, microwave, coffee maker, sink, dishware, and table with chairs. French doors open to our private poolside courtyard. Located on the ground floor. Free WiFi and cable TV. Our double suite is designed for couples, family and/or friends traveling together (sleeps four people). Two separate bedrooms with king sized bed and private bath that connect though an adjoining kitchenette. Full size refrigerator, microwave, coffee maker, sink, table and chairs, and dishware. This unit is located on the second floor and opens to a balcony overlooking the pool. Rooms are uniquely decorated in a mid-century modern theme. Free cable TV and WiFi. 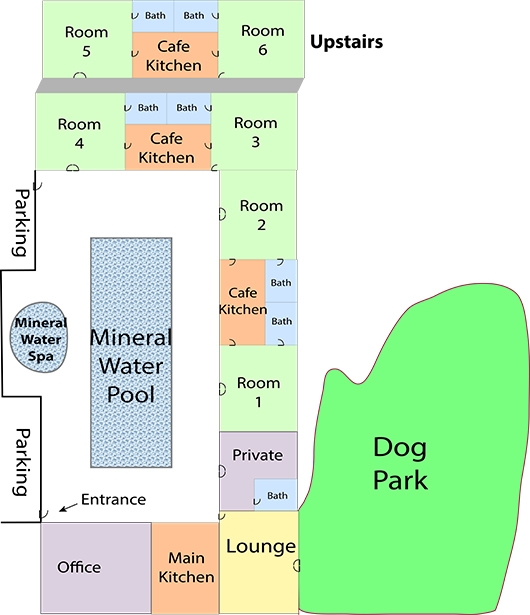 140-degree mineral water well on property. Pool and hot tub maintained at ideal temperatures for year around use. Private dog park with covered patio. Complimentary breakfast snacks and coffee. Free high-speed wireless Internet and cable TV. Robes provided with massage services. Spa toiletries and hair dryer.